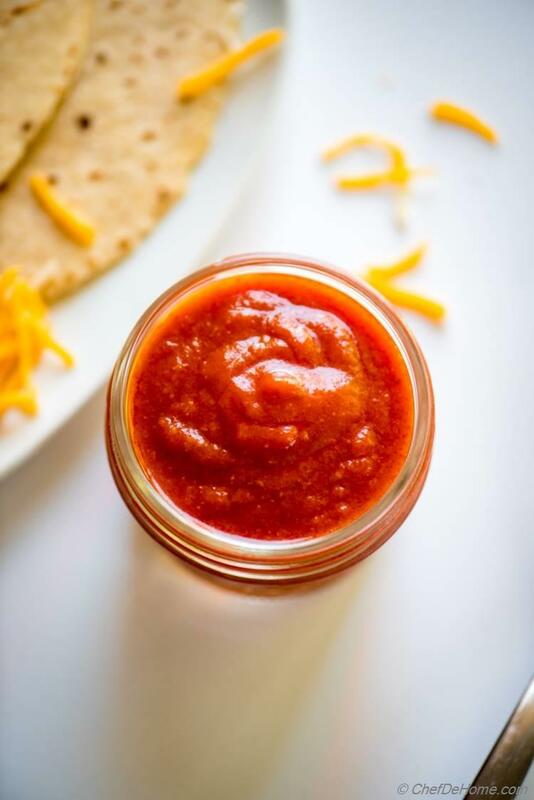 An easy and gluten free homemade Red Enchilada Sauce ready in just 20 minutes! Let's ditch the delivery and eat Mexican at home! 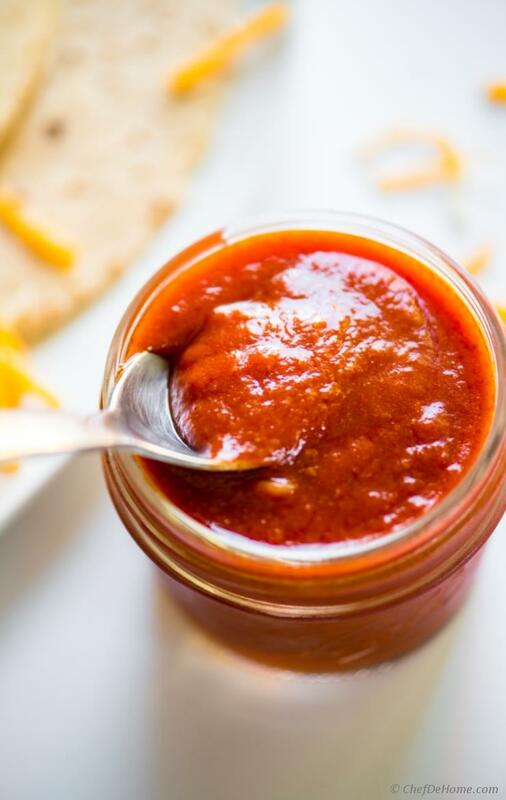 Today, I'm sharing with you an easy 15 minutes homemade Red Enchilada Sauce! Do you ever wonder what Mexican restaurants add to their silky red Enchilada sauce which makes it so delicious and deep red yet not overly spicy? I have decided to unveil those secret for you today. I honestly believe, in free countries, everyone should use their right to vote. If you are eligible to vote. Please do use your right and vote for your favorite candidate. Now, don't let me even get started on our Presidential candidates this year and let's get back to our Enchilada sauce! Red Enchilada sauce is one of the popular sauce in the Mexican cuisine and often referred as red sauce instead of red enchilada sauce. Since it is often slathered over rolled filled tortillas, I mean, enchiladas. So it is mostly known as red enchilada sauce. 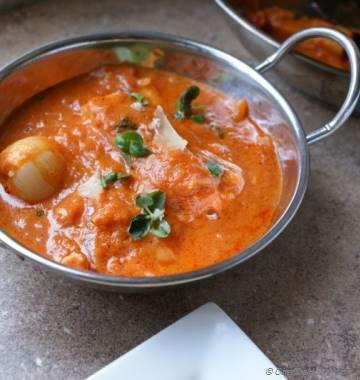 Honestly, recipe for sauce is so simple… I want to just direct you to Recipe Card and say 'Happy Cooking'. You are most welcome to jump to the recipe and enjoy homemade Enchiladas for dinner tonight! Or stay with me and let's talk about how to make Enchilada sauce even when you don't have or like corn starch or chicken stock or tomato sauce. Before I go on, I must say such simple recipes require using good quality ingredients . So for good flavor please use quality ingredients. Enchilada sauce ingredients are very easy to find. 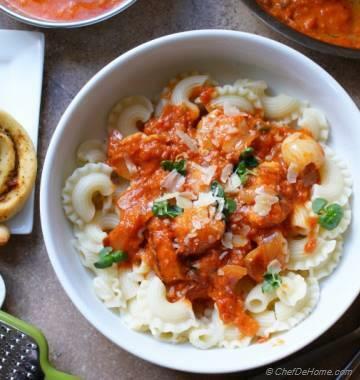 I like to use prepared tomato sauce as base because it adds a lot of flavor without much effort. If you can't find tomato sauce, you can use tomato puree. In this case I recommend cooking sauce a little longer with little more chicken stock to develop flavor. More stock because it will dilute the sauce and help it cook longer without changing the consistency of final sauce. To make Enchilada sauce vegan/vegetarian, I replace chicken stock with vegetarian stock. This is only one ingredient which is not vegetarian and can be easily replaced. When using all-purpose flour, I cook 1.5 tbsp flour in 1.5 tbsp oil whisk continuously until raw texture of flour goes away but flour is still pale yellow and has not started to brown. 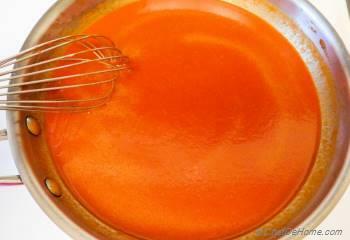 Darker slurry can change the color of enchilada sauce. So, please watch while cooking flour and oil. You can also use butter (has dairy) instead of oil for cooking flour. 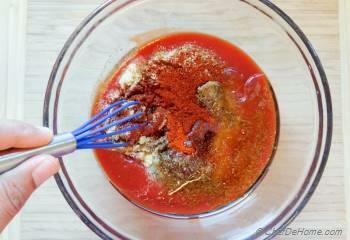 Paprika is yet another important ingredient to get beautiful red color of enchilada sauce. I used organic paprika for this recipe which was not very hot. If paprika you using is on hotter side, add half of what mentioned in the recipe. You can add more later - half way through cooking taste and add more if you like. I always make a double batch of sauce and use about 1 cup or little more for a family-size Enchilada Casserole. Remaining, I transfer to an air-tight container and refrigerate for up to 1 week. 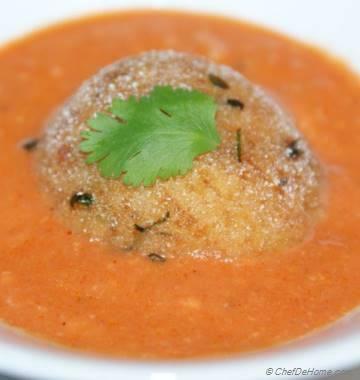 If sauce seems thicker when using… just reheat with few tbsps of chicken/vegetarian stock. That's it! You guys! 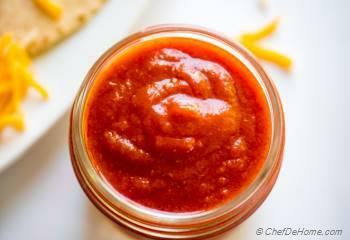 Blushing Red Enchilada Sauce is ready to rock your taco Tuesdays! I recommend making a homey enchilada casserole with coat of this sauce and serve a comforting fall dinner! You know what?! I'm so tempted looking at these pictures! I might make Red Sauce Enchilada for dinner tonight! Have a wonderful start of weekend! PS: Are you planning to sit on edge of your seat watching election results tomorrow? Then, I recommend making some dinner ahead. Ready a batch of red enchilada sauce, roll tortillas with some sauce, meat/veggies, wrap in plastic. On Tuesday, add more sauce and general sprinkle of cheese. Bake for 20 minutes and homemade dinner will be ready! Total Time 15 minutes Prep Time 5 minutes Cook Time 10 minutes Difficulty Easy Yields 1.5 Cup Serves 4 Notes No. of servings depends on serving size. Smart Swap Replace chicken stock with veggie stock to make sauce vegetarian. 2. Heat a sauce pan, add all mixed ingredients from the bowl and cook for 1 minute. Add chicken stock and corn starch. Whisk quickly so that starch does not form lumps. Increase heat to medium high, bring mixture to boil then cook until sauce thickens and have lush red color of paprika surfacing on top. 3. Remove from heat. Let cool slightly. Refrigerate in air-tight container. 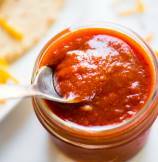 Sauce stays good in air-tight container for up-to 1 week. This sauce is not overly spicy. If you like spicy, mix in more chili power per taste.